Every now and again, there comes a time when there’s no diplomatic way to say that a game is terrible. Dark Heritage: Guardians of Hope is one of those times. This game is appalling, even for a genre not exactly known for high production values, or even polish at times. 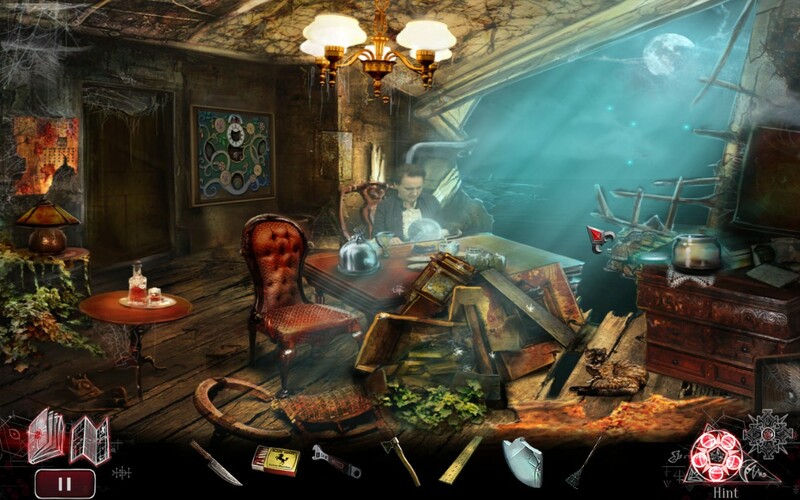 That genre is Hidden Object Puzzle Adventures (or HOPAs). Bear with me, while I explain why this game is the pits. It is an unwritten law that all houses must have a ResEvil Lock/Safe somewhere on the property. Ghosts are not exempted from this. For those who don’t know, HOPAs are a specific subgenre of adventure games, where at least a third of the puzzles (Usually more than half) involve finding hidden objects because… Well, between one and three of them (Usually just one) are important plot items, and the rest… Is just for the joy of finding hidden objects. Your mileage may vary immensely on whether that really is a joy, not only as a personal preference, but also within games. They mostly tend toward supernatural, sometimes romantic or familial stories, rely on simple characterisations, and have retained many of the same core UI elements as they had in their humble beginnings (Around 1998). Backgrounder over, let’s talk criticism. For a start, unless specifically pluralised, hidden objects tend to be the only one of their kind in an individual puzzle. Not so with Dark Heritage, which not only has objects similar to each other (You may try and click on a “Hammer”, only to find out, near the end of the game, that it was actually a “Lever”. The actual hammer is on the other side), but exactly the same type of object (For example, two wheels. One’s a bicycle wheel, one’s a cart wheel. Only one of these choices is correct. 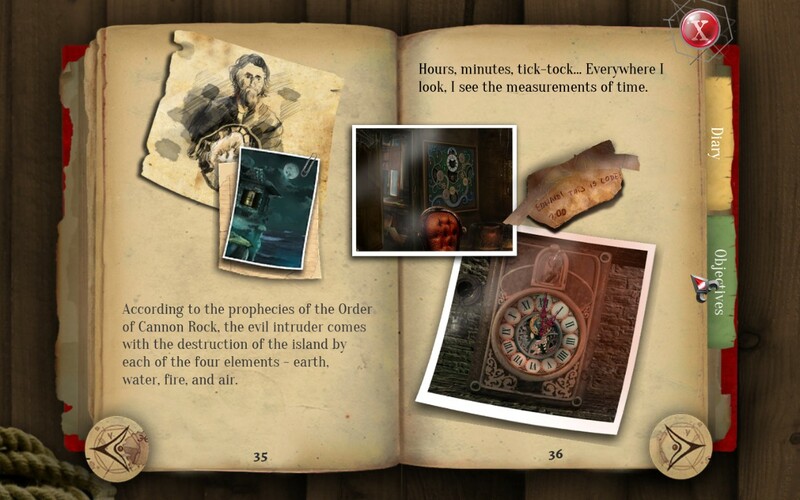 The game gives you clues via the usual journal. Those clues are not always visually clear, however. The inventory puzzles, similarly, involve arbitrary interactions, much more so than usual. I couldn’t use a saw or an axe on some planks, because, since they had bolts on them, I was clearly meant to use a wrench. You’ll lose cutting tools (Because adventure game rules), then wonder why, as your main interactions appear to be cutting, smashing, and sawing of some description. Not all of them… But enough to leave you scratching your head, wondering why the hell you can’t smash this time. This is the emotion portrayed throughout the conversation. Note also that that’s a webcam wig. You can tell because of the odd movements compared to the head. 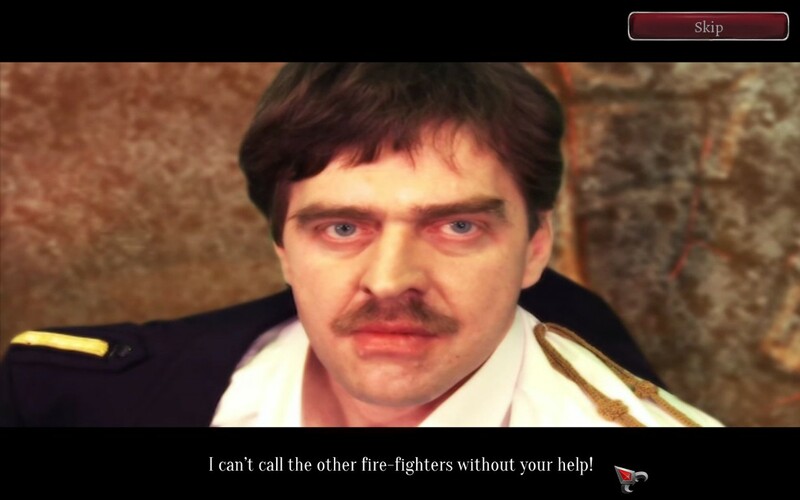 The game attempts to experiment, with FMV actors over the usual fare of mixed 2d/3d scenes. This would be interesting, if a) They had something worth saying, and b) The actors weren’t asked, for some bizarre reason, to mostly just portray a single emotion, maybe two (Sometimes none! ), with little to no relation to what is being said, or how it’s being said. The story is paper thin, even for a HOPA, and it can basically be summed up as Hero’s Journey Lite. “Get McGuffin, Beat Evil Master, and also solve the fiendish mysteri-” Oh, wait, we already covered those mysteries, didn’t we? They’re fiendish, alright, but not in the way you’d like. HOPA fans will find the hidden object annoyances frustrating, Adventure game fans will not be sustained by the story, the acting (Voice or otherwise), and both will be annoyed by the inventory puzzles. This is one of those times I can’t recommend a game to anybody except those of us who look at games to see what the hell went wrong. And that makes me sad. The Mad Welshman checked his pockets and sighed. He’d left his keys at home, and would have to solve a jigsaw puzzle, find a crowbar in among 11 other objects, break some planks, find some nails and a hammer (One of which was behind a colour matching lock), and build a ladder to get back in. Just another day, he sighed, as a Ghoul engaged him in conversation at the bus stop. In the beginning, there was only void. And then God said “Hey, I’ve got these four elements, let’s bang them together and see what happens!”… And then the miracles of life, technology, and the like occurred, with the occasional muttering of “No, I’m pretty sure that should have done something.” Such is Doodle God, a simple, yet fairly entertaining puzzle game, where you put things together to make new things. Fire and Water, for example, makes Steam, while later on, Money and Banks make Debt suddenly come into existence. For a puzzle game in the region of £5, it’s got a fair amount of content, with the main game (Containing four chapters of putting things together, with some simple and slightly silly story to go with it), puzzle mode (Where you’re aiming for something specific using a limited amount of elements), Quest mode (Mini stories), and Tournament (A daily quiz tournament, requiring coins to enter, that give hint rewards and more tournament coins). There’s a fair bit of variety, although not an amazing amount of replayability unless you really feel like it outside of Tournament mode. It looks alright, the music is relaxing, and the world of the main game fills up as you get more things made, which is a nice touch for such an accessible game, simple in both concept and control. There’s just one small problem, and two larger ones. The first larger one is inherent to the game itself, in that, the further the game progresses, the more likely you are to be fruitlessly shoving things into each other in the hope that you’ll find the things you need to progress, as some elements only have a few interactions, while others… Have a lot. Humans, for example, get shoved into a fair few things, but Plasma is something that gets relatively little love. There is a hint system, but it leads to the other problem with this game: Microtransactions. …But there are many things you can fill the world with. Thing is, the microtransactions are for… Er… Hints. And, in the main game at least, they’re just on a cooldown rather than “Once they run out, buy more please!” It honestly feels extraneous and pointless, since… It’s a Steam game. 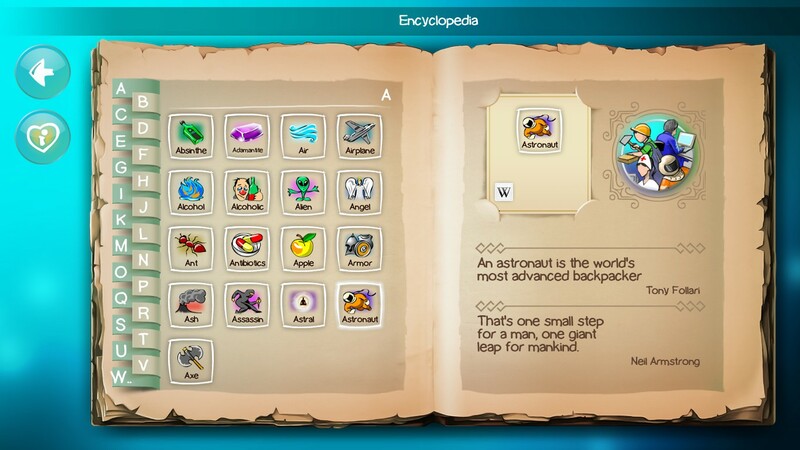 The series has been around long enough from its free game origins that guides exist. And I know people would rather look something up than give someone money for hints in this day and age. Finally, there’s the second larger problem: Some of the combinations are logical stretches at best, and somewhat nonsensical at worst. I often found myself scratching my head, thinking “Okay, how does this and this… Make that?” A good example (Only occurs once, to my knowledge, so not a huge spoiler) is that, at one point, Astral and Death makes… Er… Mindflayers (Y’know, the DnD monster. Psychic, has tentacles, octopus headed, eats brains?). That’s by no means a simple connection, and you occasionally feel that there could have been a simpler way to do things. 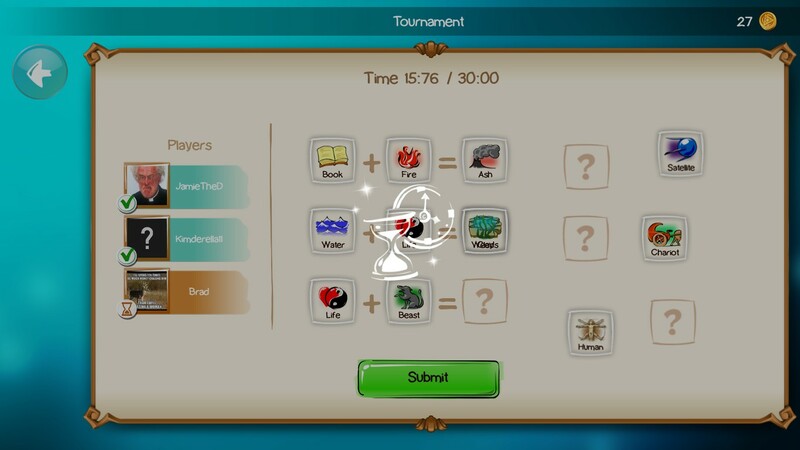 Tournament mode, it must be noted, has one somewhat annoying bug. See if you can spot it. Still, Microtransactions can be ignored, there’s a fair amount of content for the price, and puzzle fans might find this one interesting. You’ll know fairly quickly whether you like it, hate it, or don’t particularly care about it. Just be aware that, unless you’re a completionist, you’re going to finish the game, finish the puzzles, quests, and artefacts, and be left with… 3 to 5 achievements to the game left, and the tournament. Personally, I finished the review and the game in a day’s worth of play, and don’t find the tournament all that “Addicting”. But I’m not you. 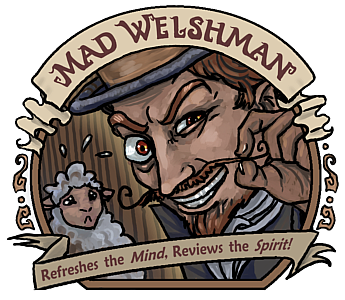 The Mad Welshman accessed his GodPod, clicked on Electrons, then on Printing Press. And Lo, Dideth Reviews Come To Pass. 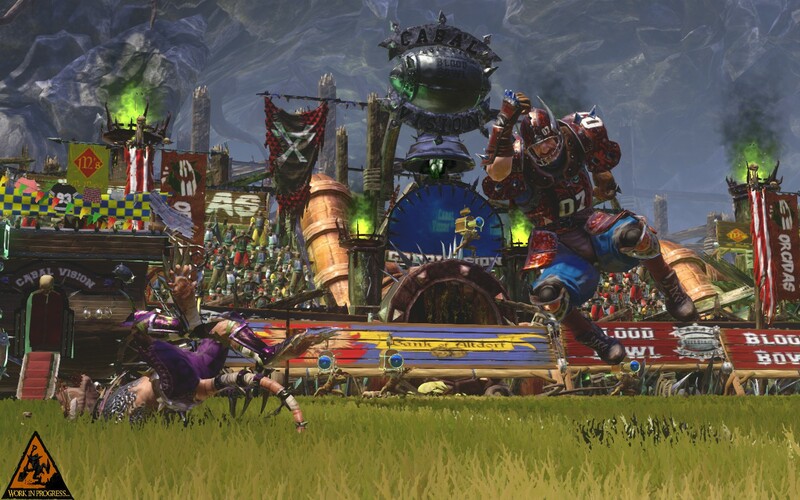 Blood Bowl, the turn based strategy game set in Warhammer’s equivalent of American Football, has returned. Except it never really left, and I’m feeling very conflicted about this release. For context, this review comes from somebody who has been playing the game since Dark Elves Edition of Blood Bowl “1”. Which was the second of four editions of the same game. This, in essence, is an elephant in the room. And I can’t really avoid talking about it. No, no, that’s the *Ogre* in the room, not the elephant! Geez! 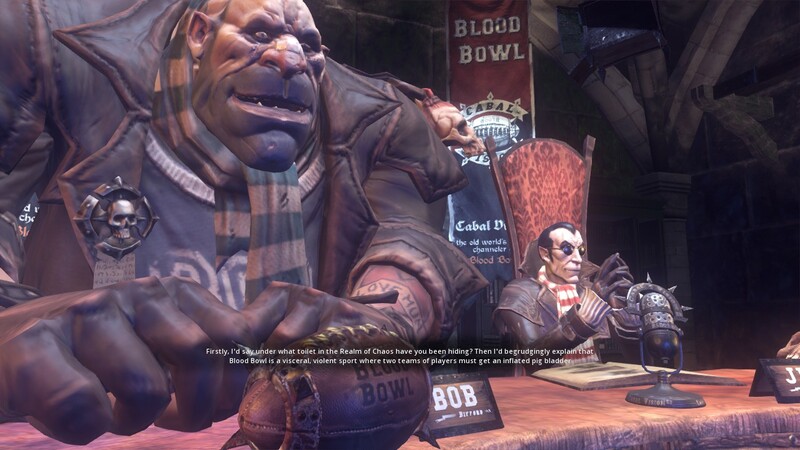 At its core, Blood Bowl is about positioning, use of skills, and dice. Lots of dice. Dodging is a dice roll. Passing, blocking, throwing, catching… All dice. Rerolls are a thing you can buy for your team, and they’re important. Beyond that, there’s play styles that each team are suited to. Skaven, for example, play a running game: They’re only okay at passing, but they’re good at dodging away from players marking them, and they can run a long way. Orcs, by contrast, are bashy: They excel at punching things, relatively bad at passing and dodging, and are about average in terms of mobility. It’s relatively easy to learn, but mastering it takes a bit of thought and practice. Your average game takes between 1 and 2 hours, so it is somewhat time consuming. I would like to begin by mentioning that Blood Bowl has a variety of teams, but this is only really true for Blood Bowl: Legendary Edition, and Chaos Edition. 2 is a complete reset, with a new engine, and new design decisions… And funnily enough, this is part of the problem, the elephant in the room. Blood Bowl 2 is undeniably prettier than the previous 4 editions, with meaty animations, a UI where players’ stats and skills are represented by collector’s cards, and some quality sound work. But it’s also a more limited experience than previous editions, in more areas than just the 8 teams (plus one team if you pre-ordered) compared to Chaos Edition’s 23 (More teams are coming, but as DLC.) Not helping is the fact that many of these new or changed features are implemented in odd ways. 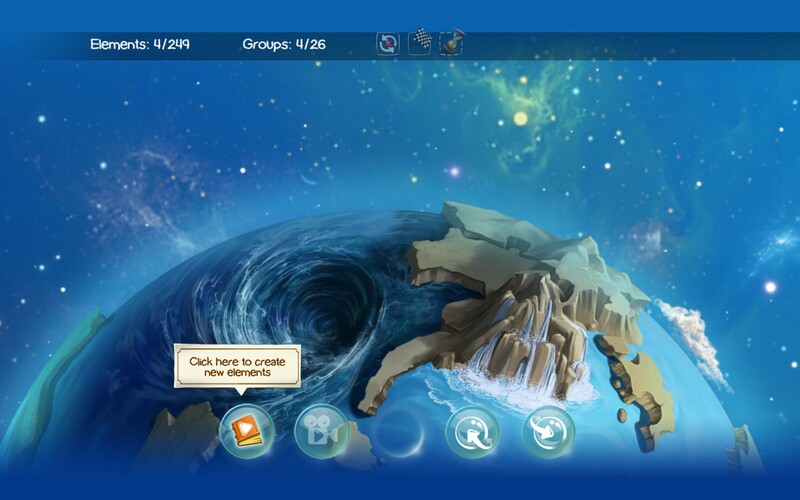 The animations are undeniably cool… But they pad playtime. For example, the “Campaign” is somewhat similar to Legendary Edition’s, in that it’s a combination tutorial/challenge mode, with surprise events. But it’s more limited in the sense that you are playing one team (Humans, the generalists) instead of learning core mechanics from multiple teams, and oddly implemented in that the tutorial section (Comprising at least the first two hours of play if you go there first)… Is teaching in ways that experienced Blood Bowl players would scratch their heads at. Part of a match is played before teaching about buying players (With less options than you’d have in a real game, and much worse AI), and then another match goes by (Finally showing you blocking and other important skills) before you can buy “Staff” (Apothecaries, “Fan Factor”, Cheerleaders, and, rivalling in importance to Apothecaries… Rerolls). Meanwhile, if a new player chooses to hotseat play both sides of a Friendly match, with an experienced Blood Bowl player’s YouTube video open, they’ll get a feel for movement, passing, skills, and the like in… Probably less time than the Campaign does, and for the team they want to play. Animations, meanwhile, are a feature that experienced players would like to selectively ignore. But the selections are… Touchdowns only, “No animations”, or All animations. So that’s a choice between “Watch running and touchdowns”, “Watch running”, and “Watch running, touchdowns, and every single block that isn’t a push, with a side order of every time you fail a dodge or attempt a pass.” The animation system also appears to have led to less customisation than previous editions of Blood Bowl, with only set colours, no armour changes beyond those gained by levelling up (and some skills/mutations), and a set of heads to choose from as your main customisation option. It is an unofficial “rule” that you must make bad puns when naming your team and its members. Controls and camera, similarly, will make returning players scratch their head. 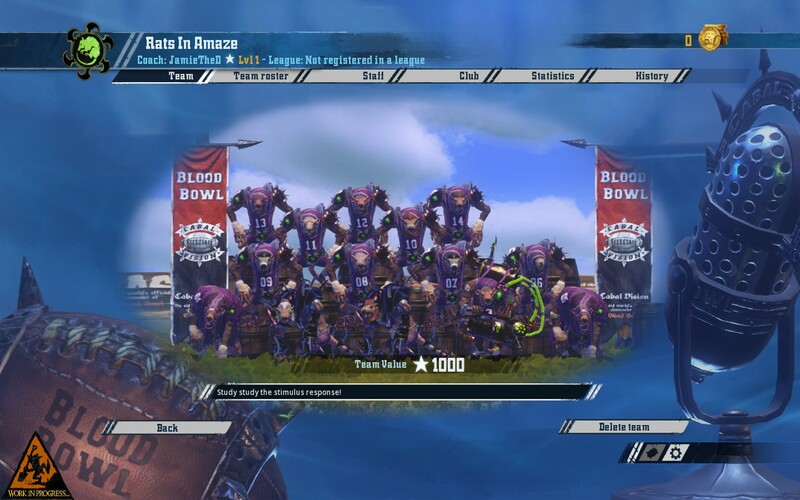 Previous editions had a fully movable camera with the ability to show player names, player positions, and tackle zones/movement ranges, but Blood Bowl 2… Plays it slightly differently. 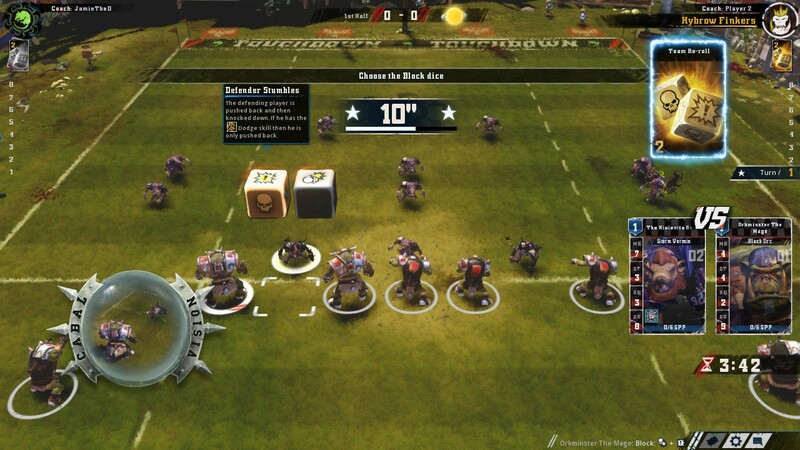 There are two cameras at a fixed angle, with a fixed zoom arc (Movable, though) marked “Blood Bowl 2 Camera” (Faces toward the opposite left corner of the pitch) and “Blood Bowl 1 Camera” (Faces the opposing endzone). Controls are also in “Blood Bowl 2” and “Blood Bowl 1” flavours, but the latter isn’t quite accurate, as Blood Bowl 1 allowed a player to queue movement, then passing in one go, while Blood Bowl 2… Doesn’t. The difference appears to be “Right click for movement in Blood Bowl 1 Controls”… And that’s it. Passing, as opposed to BB1, is a case of moving, waiting until the move animation is done, then passing. Generally your first action in a Blood Bowl match is to hit someone. This isn’t to say that there aren’t some new and interesting features. Upgrading your stadium. Coach levels. Sponsors. Aging. And, of course, the newly implemented team, the Bretonnians, whose Blitzers do most of the work, whose Linemen are, as with most Linemen, fodder that you might care about if they levelled up, and whose Blockers are interesting in that their starting skill (Wrestle) means you have to make a deliberate choice of ignoring Wrestle, and thus having a slightly weaker “Blocker” than similarly levelled Blockers of other teams, or making a nonstandard build and ignoring the majority of the Strength skill tree (Which is normally a good thing for Blockers, but the majority of Strength skills don’t synergise well with Wrestle). The preview of what your action will likely do is also nice. Normally, I’d say this was an interesting game with some odd design decisions and implementations. But the elephant in the room, that all important context that there are four previous games, at least two of which have more teams (Legendary/Chaos Edition), at least one of which has a better tutorial/challenge campaign for its Single Player in terms of teaching and team variety (Legendary Edition), and at least one edition has both a devoted playerbase and a cheaper price tag (Chaos Edition, at £20) means that… I’m not entirely sure I can recommend Blood Bowl 2 at the present time. Which is incredibly awkward for me, as, while I want Blood Bowl to continue selling, the increased shininess… Really doesn’t disguise some awkward design decisions that make it, in its own way, just as clunky as the previous 4 games in the series. The Mad Welshman coaches many teams, in many universes. He’s going back to the one where he can play the Legendary Khemri Passing Game now. He feels oddly sad that this is so. 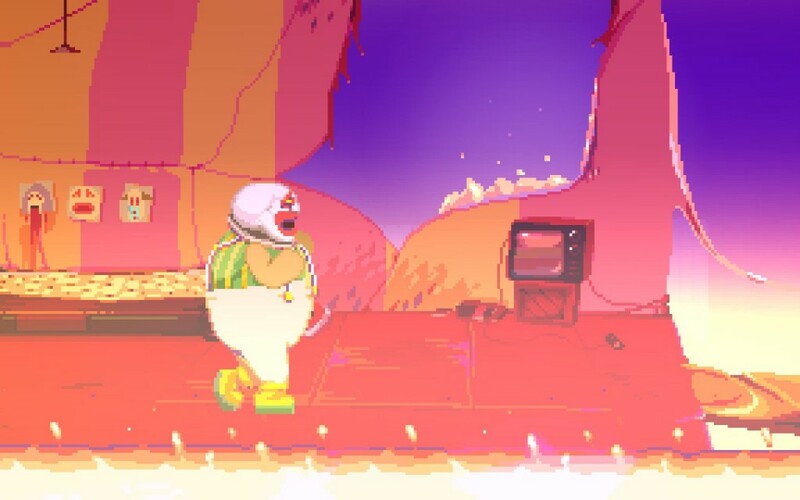 Dropsy is a point and click adventure that reminds me of classics like Coktel’s Gobliiins (multiple i’s deliberate), where interactions are mostly simple, but some puzzles take a bit of thought. Certain things may confuse the first time player, used to other genres. The map is just that, a map. It’s not a teleporting map, like some games. Just a map. Dialogue and writing appears mostly gibberish, but that’s because paying attention to the dialogue bubbles is what’s important. And knowing the strengths and weaknesses of your two characters, Dropsy and his pup, are important. But enough about play, because this game is definitely a game working more on feelings than mechanics. And my, it definitely does that. …Because sometimes, you can make someone’s world better. Is the game perfect? Oh, heck no. 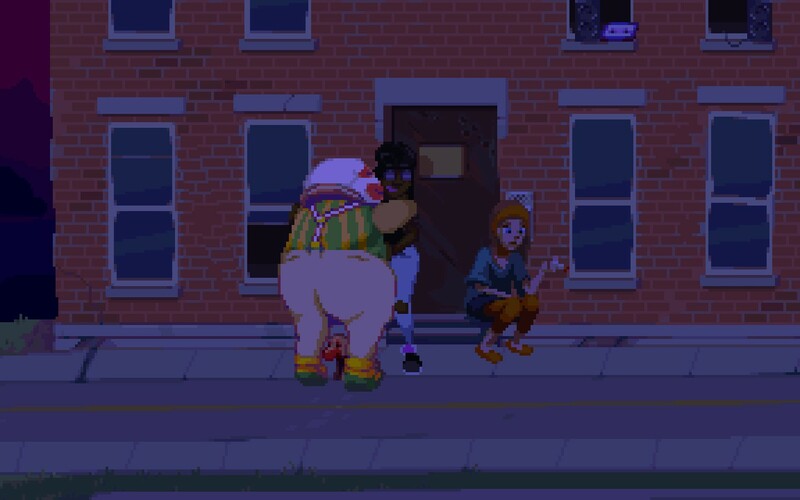 Some of the puzzles are a little obtuse, Dropsy’s walk animation makes me verrry uncomfortable, but the core message behind the game shines through in many senses, and that message is: Everyone deserves hugs and love if they want it, and it can be easily offered. But I’ve fallen in love with this snaggle toothed clown, and good lord, if I had the chance, I’d give the guy a hug myself. In short, it oozes character, and language becomes less important. Except the language of giving, and hugging. It feels slow at times, but if you’re good with that, I’m definitely good with that. If you like Point N Click that’s simple to play, but tough to work out (at times), then this may well be for you. <3 Huuuuuuug! <3 … Y’know, if you want one. 20XX is a very important year. In that one year, a robotic hero fought many evil robots, many a time, and achieved many great things. Not as many as Astro Boy, though. 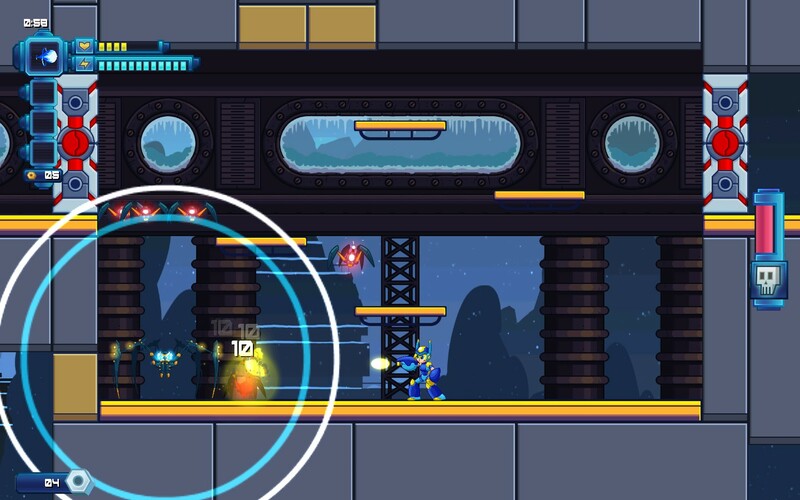 20XX is also a procedurally platformer inspired by the Mega Man series, which moved to its beta stage on the 15th of this month. So… How the heck is it? Don’t get close to Terror Spider. If the Gravwave doesn’t get you, the bomb-spiders will! Not bad, actually! 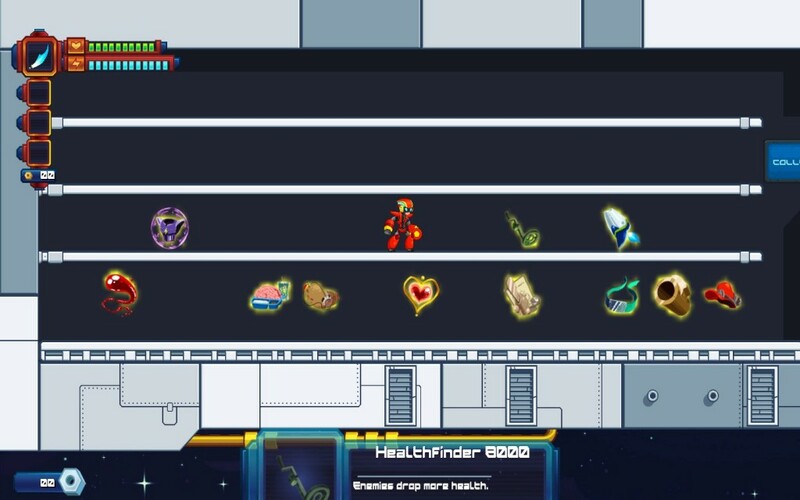 You might feel a little discouraged by the slightly amateurish looking heroine and hero robots (Nina [Megaman style], who is your default character, and Ace [Protoman style], the red dude), but everything about this game reminds a player pretty hard of a MegaMan game… Until they run across those all important differences. Make no mistake, this is a game with elements of roguelike design. But for those who never played a MegaMan game, let’s keep this simple. You are a robot, fighting other (presumably evil) robots for (presumably good) reasons. The other robots, thankfully, are not very good at logistics, and have left all sorts of crates and goodies around that might help you, from bolts (Currency), to items (Boost your stats), to entirely new systems compatible with all robots (Weapons and special abilities). You run, dash, jump, wallhop, and shoot your way through levels, fighting a pattern based boss monster at the end of each, get a reward for each level you clear, and pick one of three other bosses from a number of choices to fight next (Each preferring a certain kind of stage). You die once, that’s it, start again from the beginning. But that’s not necessarily a bad thing, because collecting “Soul Bolts” during play unlocks more things to grab between runs. The beta even has “Casual” mode, which… Starts you with 3 items, as opposed to none. More helpful than nothing, considering the variety of items. There is quite a variety of items… And it may take a while to get them all. The game recommends a gamepad, and I’d mainly agree, if only because it otherwise means rejigging an odd (But workable) set of keybinds. The game tutorialises pretty well, so the main thing to deal with is how it feels to play. Most of it actually feels alright, although it does seem as though levels are balanced more for Nina than Ace, and her alternate weapon modes seem better balanced overall. Most of the time, there are multiple paths to your exit, the enemies scale pretty well, and the weapons are interesting, even if they sometimes feel overpowered. The experience could be better in places, however. While there are some things you can avoid, others generate a little harder than they should for the level they’re on. A single disappearing block going in and out quickly between two deadly flowers? That’s mean. However, for the price being asked, it’s not a bad game, with a fair amount of replay value coming from the generation. There are only three “worlds” right now (A foundry, an ice stage, and an air/jungle stage), but there’s enough variation to keep you busy (For example, the foundry stage can have fire blasters, lava pits, and various different enemy types, not all of which will appear the first time round.) Aesthetically… I honestly preferred the earlier version of Frostor, aesthetic wise, but I can understand the decision to make it easier to read. As to the boss battles, in true MegaMan fashion, they’re pattern based, so once you understand the pattern, it’s a case of… Well, not getting caught in it. Importantly for a procedurally generated game, it doesn’t often feel unfair. It does every now and again, but since it’s currently in the beta stage of Early Access, I’m willing to say that’s subject to change. 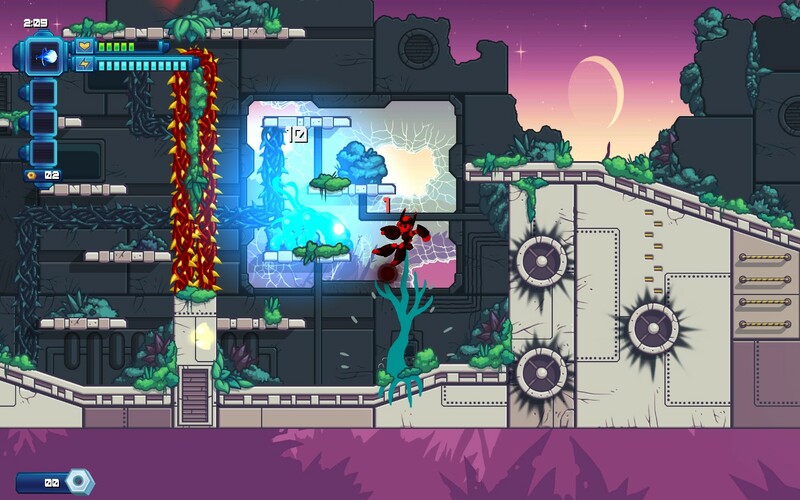 So if you like action platformers with some roguelike elements, this is worth at least a look.